NEWARK -- Not long after the Chicago Blackhawks dealt away both Dave Bolland and Michael Frolik, they announced the re-signing of forward Bryan Bickell to a four-year, $16 million deal, according to ESPN.com's Pierre LeBrun. The trading of Bolland and Frolik freed up the cap space to give Bickell a raise from the $600,000 he made this past season. Bickell, who scored nine goals in each of the last two seasons, increased his asking price with each one of his nine goals during the Blackhawks' run to their second Stanley Cup in four years. One of those goals tied Game 6 with 1:16 left in regulation against the Boston Bruins. Seventeen seconds later Bolland put the finishing touches on the comeback. There's a good chance Bickell would have fetched more money had he tested the unrestricted free agent waters, but last week he expressed a desire to stay in Chicago and would be willing to accept a hometown discount. 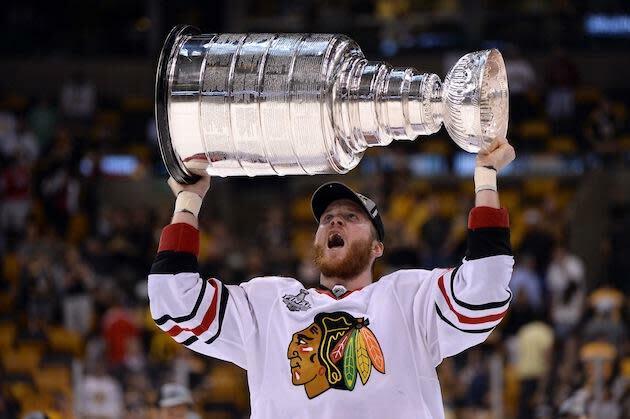 "You've got to do what makes you happy," Bickell told ESPN Chicago.